Do Kids in Your Neighborhood Walk to School? Walking to school used to be a rite of passage for kids. It was part of everyday life; part and parcel of growing up. In the past few decades, that has changed. A combination of fear mongering about traffic and crime as well as families living further from schools has resulted in less and less children walking or biking to school. In 1969, 48% of kids walked or biked to school. Of those living within a mile of school, almost everyone (89%) did. In 2009, only 13% of children walked or biked to school while just 35% of kids living within a mile of school did. Walking to school offers myriad benefits to kids behavior and health, educational outcomes, and even traffic safety. Kids who exert more energy before they learn are more likely to be able to sit through their lessons, less likely to be obese, and perform better academically. Drivers who see kids walking or biking are more likely to slow down, which causes other drivers to slow down as well, making loc al roads safer for everyone. Cities and school districts that work to create safer ways to walk to school ultimately benefit themselves, making their roads safer, their educational outcomes better, and their youngest constituents healthier and better equipped to learn. Communities across the country have implemented Safe Routes to School programs to encourage walking and bicycling to schools. Even without a formal program, small changes can make a big difference in getting kids out of cars and buses and back on their feet. 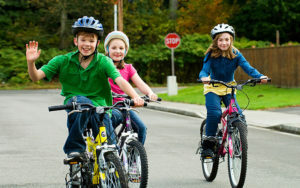 Educational campaigns geared to local school parents and children have proven to be a successful technique to increase awareness of the benefits of walking and biking to school. 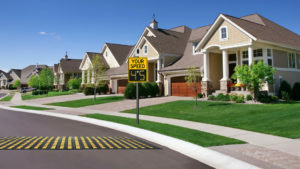 Slowing cars down along routes that are popularly used for neighborhood children with speed display signs, variable message signs, or speed humps can give parents the added encouragement they need to allow their kids to exert their independence and head to school on their own. PreviousPrevious post:Building Better CitiesNextNext post:Will Vision Zero Change the World?